The Twitter account of Somali militant group al-Shabab has been suspended, after it was used to threaten to kill Kenyan hostages. Al-Shabab launched its Twitter account in December 2011, after Kenyan troops went into Somalia to combat it. Earlier this month, it used Twitter to announce it would kill a French hostage and then said it had done so. 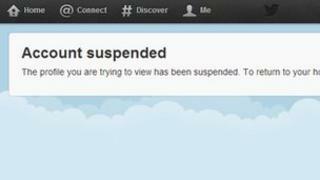 Twitter refused to comment on the suspension but its rules say that threats of violence are banned. On Wednesday, the al-Shabab account posted a link to a video of two Kenyan civil servants held hostage in Somalia, telling the Kenyan government their lives were in danger unless it released all Muslims held on "so-called terrorism charges" in the country, reports Reuters news agency. Laura Hammond, senior lecturer in development studies at the School of Oriental and African Studies (Soas) in London, said the US had wanted the al-Shabab account closed for some time, but had lacked the legal means to force Twitter to act. "It's been in good English, leading to speculation as to whether the author is Somali or a foreign member of the movement," she told the BBC. "The group has used it to reach out to potential recruits, but more often to rebut information from the African Union peacekeeping force (Amisom) and the Kenyan Defence Force. "Al-Shabab has tried to counter the rhetoric about the idea that it is weakening and Somalia is moving on without it." Al-Shabab, which is affiliated to al-Qaeda, said it killed French intelligence agent Denis Allex last week in retaliation for a failed French operation to free him. The French government has said it believes Mr Allex was killed during the raid, in which two French commandos also died. Mr Allex - a French spy - was kidnapped in Somalia in July 2009. Al-Shabab has been forced out of Somali's main towns over the past 18 months but it still controls many rural parts of southern and central Somalia. For more than 20 years Somalia has seen clan-based warlords, rival politicians and Islamist militants battling for control of the country.